A little more good injury news for the Thunder tonight, head coach Scott Brooks told reporters before that game that forward Nick Collison will play tonight. "We've missed Nick," Brooks said, "so it's good to have him back tonight." Brooks is also adjusting his starting lineup, putting guard Andre Roberson back in and taking guard/forward Kyle Singler out. 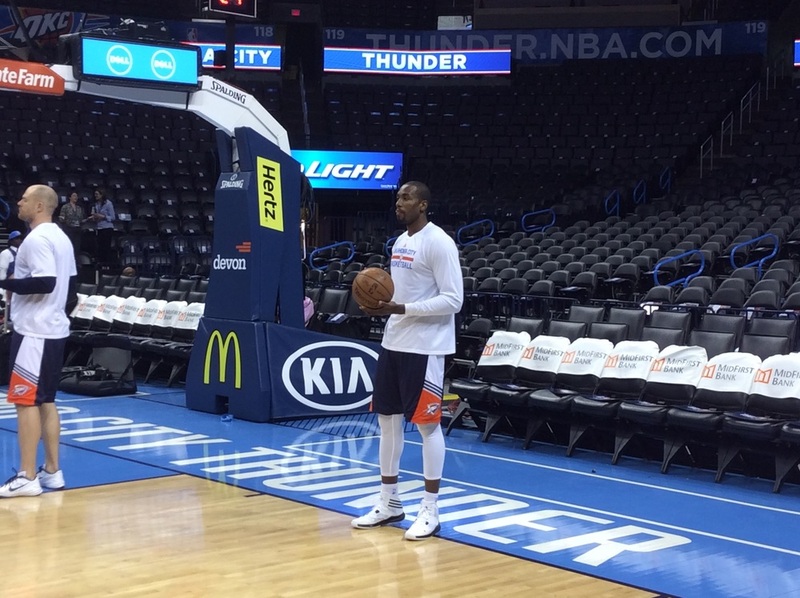 The Thunder will still be without forward Serge Ibaka. Ibaka worked out with jis teammates before the game tonight doing some individual drills. He's appeared to have stepped up his workload recently but Brooks says he's still got a ways to go. "He hasn't practiced with the team, he has shot around. he's not playing tonight and I can tell you he's definitely not playing in the next game either." That would be Sunday at Indiana. After that the Thunder just have two games left in the regular season, Monday night at home against Portland and then Wednesday night on the road at Minnesota. So it's becoming more doubtful that Ibaka will make it back before the playoffs and his absence will make it that much more difficult for the team to get in. The Thunder catch a break tonight, playing a Kings team that's not all that good anyway and tonight they will be playing without three of their best players. Sacramento's leading scorer and rebounder, DeMarcus Cousins, is out with a sore foot. This will be the third straight game he's missed. Second leading scorer Rudy Gay is also out with concussion symptoms. Gay had missed three games, then played Tuesday against Minnesota, scoring 33 points. He had to miss Wednesday's game against Utah and will be out again tonight. Kings point guard Darren Collison is also out and has been for the last 30 games. "It's gonna be a challenge for us tonight," Kings coach George Karl told reporters, "you might see some zone from us tonight and we may have to try some things we haven't done before." especially when it comes to defending Thunder superstar point guard Russell Westbrook, "I don't know how we're gonna stop him, or who's gonna stop him." Karl also praised the efforts of Thunder coach Scott Brooks for keeping the Thunder in the playoff race despite all the injuries OKC has been through. "I think Scotty's done a magnificent job with this team will all the injury chaos they've had." Tipoff is coming up at 7:10 on Fox Sports Oklahoma. Our full crew is here and we will have live updates all ga,e on our Twitter feed page and then complete postgame coverage with interviews from the lockerroom.